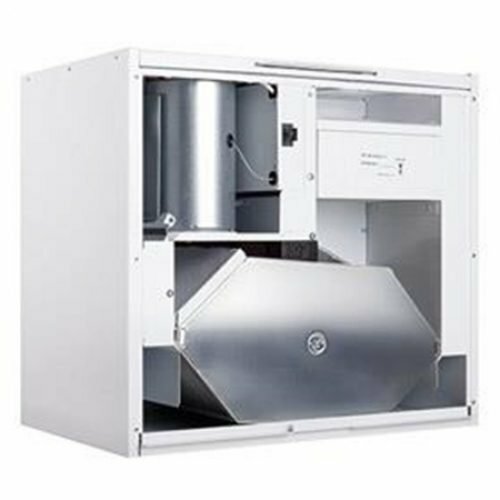 The air handling units VUT H EC ECO and VUT EH EC ECO are the fully-featured ventilation units that ensure air filtration, fresh air supply and stale air extract. 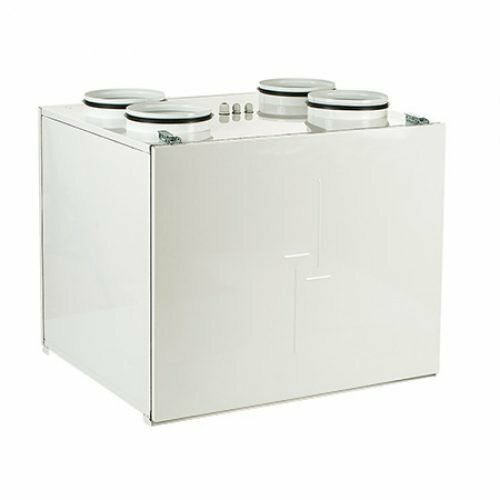 The sensible heat contained in the extract air is recuperated in the high-efficient plate counter-flow heat exchanger to warm up supply air. The units are applied as components of ventilation and air conditioning networks for various premises. Due to high-efficient EC motors and expanded counter-flow heat exchanger surface the energy saving parameters of the ECO series units are the best at the market. Compatible with round Ø160, 200 and 250 mm air ducts. 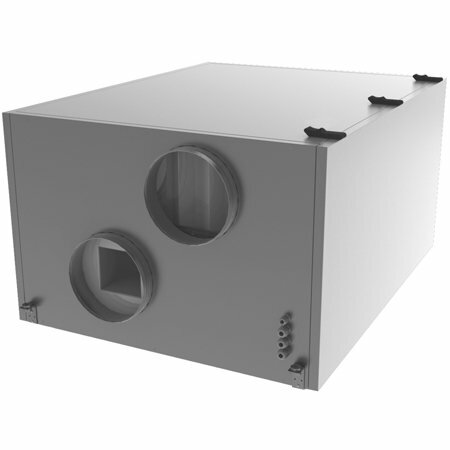 VENTS VUT H EC ECO model is equipped with a counter-flow heat exchanger, a bypass and EC motors. 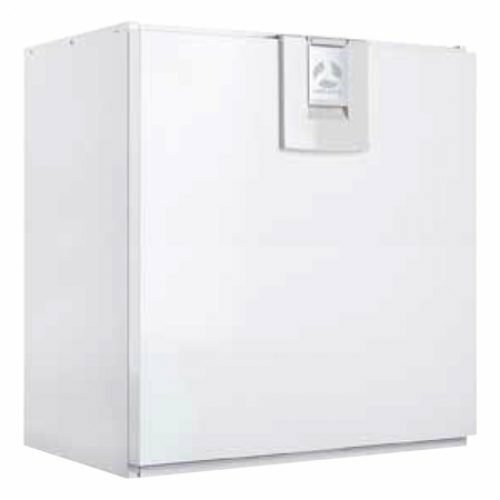 VENTS VUT EH EC ECO model is equipped with a counter-flow heat exchanger, a bypass, EC motors and an electric heater. Made of aluzinc, internally filled with 25 mm mineral wool heat- and sound-insulating layer. Supply air flow is purified through a bag filter with G4 filtering class. F7 class filter is available upon separate order. Extract air flow is purified through a panel filter with G4 filtering class. High-efficient electronically-commutated motorswith external motor. Such motors are the most state-of-the-art energy saving solution. EC motors are featured with high performance and total speed controllable range. High efficiency reaching 90% is the premium advantage of the electronically-commutated motors. The unit sizes 300 and 400 are equipped with constant flow fans with forward curved blades.These fans provide constant set air flow even in case of variable air resistance in the ventilation system, i.e. in case of clogged filters. The 900 size units are equipped with fans with backward curved blades. High-efficient plate counter-flow polystyrene heat exchanger. The drain pan under the heat exchanger block ensures condensate removal. The VUT EH EC ECO units are equipped with an electric heater to enable supply air warming up to set temperature. The VUT H EC ECO have no built-in electric heater. It is available upon separate order and may be integrated into the unit. The unit includes an integrated automation and a multifunctional control panel with a sensor graphical display. If the unit is equipped with an electric heater in case of freezing danger according to the temperature sensor readings the bypass damper is opened to let supply air flow through the bypass duct and not come in contact with the heat exchanger. 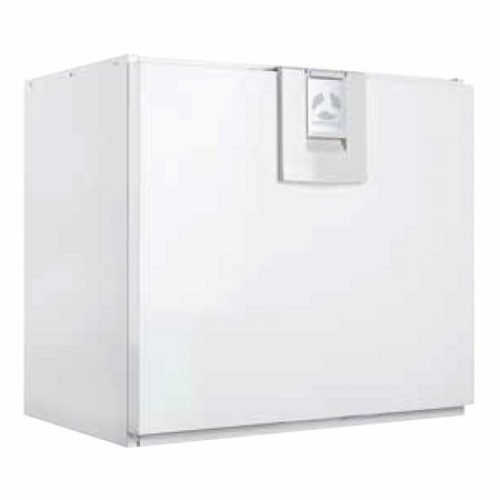 The heater warms up supply air up to the required temperature and the heat exchanger is heated by the warm extract air. After the heat exchanger defrosting the bypass damper closes the bypass duct and the unit reverts to the standard operation mode. If the unit is not equipped with an electric heater in case of freezing danger according to the temperature sensor readings the supply fan is stopped and warm extract air warms up the heat exchanger. After the heat exchanger defrosting and when the freezing danger is no longer imminent the supply fan is restarted and the unit reverts to the standard operation mode.